A group of Bullis Charter School parents established the Bullis Boosters Summer Bridge Camp to provide a summer camp experience for underserved local students. The camp, in its second year, offers a free, weeklong program for second- through fourth-graders from the Los Altos and Mountain View Whisman school districts. Charter school parents Martha McClatchie and Grace Yang co-founded the camp, which ran last week at the charter school on the Egan Junior High School campus. And the timing of the camp is intentional, Yang added. “Having the camp when we have it – two weeks before school starts – and just getting kids back in that mindset brings a real confidence when they come back to school in two weeks,” she said. Yang and McClatchie stressed that the camp takes a village to host. The pair estimated that there are as many volunteers as there are campers – 50 – devoting hundreds of volunteer hours. 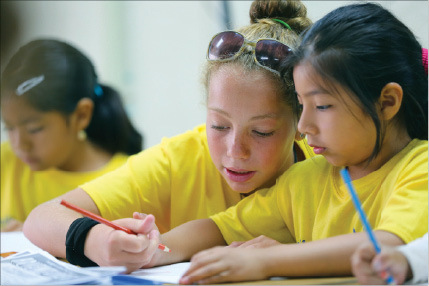 The campers enjoy a small-group experience, with a ratio of approximately 6:1 in the classroom. Assisting are 14 volunteer counselors from local high schools and a number of volunteers from Explorabox and i3, who oversee science and math activities. Explorabox, a nonprofit organization based in Los Altos, produces science-in-a-box kits that encourage students to participate in hands-on activities. Explorabox donated its boxes and volunteers to the camp. i3, a group of Stanford University mechanical engineering students, volunteered to conduct science experiments and math games with campers. In addition to the daily language arts, math and science activities the camp offers, students took a field trip to Deer Hollow Farm, where they identified plants and animals and connected them with their camp curriculum. Yang said student engagement is part of what makes the Bullis Boosters Summer Bridge Camp unique. The camp is a true volunteer effort, McClatchie said. The only paid staff members are the two teachers, one from Castro School and another from the charter school. Local organizations, including Linden Tree Books, Whole Foods Market, The Counter, LuLu’s, Spot Pizza, Choice Lunch, Smitten Ice Cream, Explorabox and the Kiwanis Club of Los Altos, donated supplies, lunches and money to offset camp expenses. In the future, McClatchie and Yang said they want to create a “camp-in-a-box” model to share with other school districts. “All you need is a group of dedicated parents to get started,” McClatchie said. For more information, visit bullisboosterscamp.org.